Messiah College has experienced a substantial growth in the popularity and offerings of its athletics programs and intramural recreation programs. To address the growing need for space, modern amenities, and equipment, SFA was engaged to design an addition and extensive renovation of the Sollenberger Sports Center. 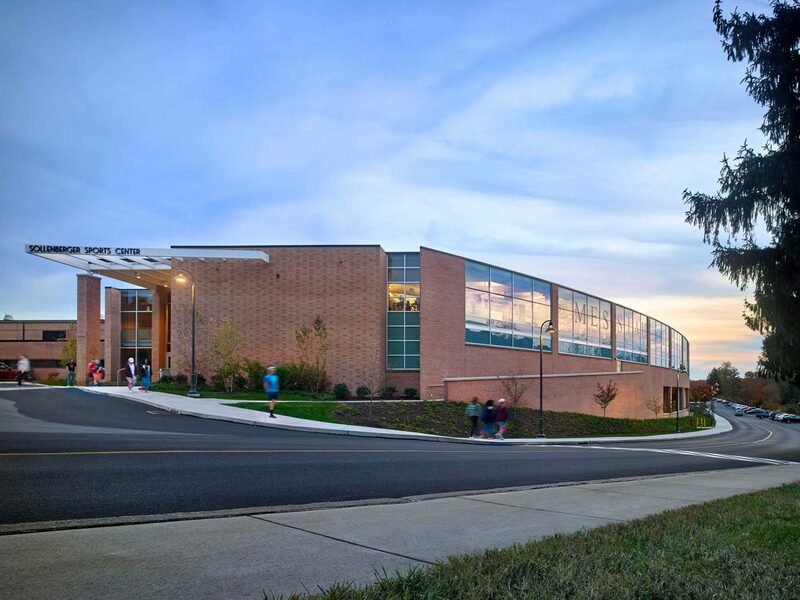 Spillman Farmer Architects has collaborated with Messiah College on several campus projects, including a comprehensive Master Plan. Following the plan, the Spillman team was engaged to design the extensive addition and renovations to their Sollenberger Sports Center. Over the last 5-10 years, Messiah College has experienced a substantial growth in the popularity and offerings of its athletics programs and intramural recreation programs. Consequently, its facilities were becoming overcrowded and in need of modern amenities and equipment. Spillman Farmer designed a substantial addition to the existing athletics facility to create a hub for student life. The addition includes a gymnasium with two courts, a flexible weight / cardio / group fitness spaces, a wrestling room, multi-purposes spaces, and a lobby. The team also renovated the existing athletics spaces to better meet the needs of Messiah students, faculty, and staff. The addition also hovers on top of a 50-space parking lot to alleviate the campus’ parking concerns. The Sollenberger Sports Center project was one part of a three-phased project that integrated efficient and environmentally conscious energy sources throughout the campus. The SFA team also designed the campus’ Combined Heat & Power (CHP) Plant, as well as renovations to the Lottie Nelson Dining Hall.